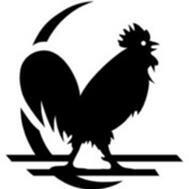 Sportsman incubator packages include all shipping charges. All GQF 2019 shipping charges on the web site were updated 1/30/19. 1202, 1500, & 1502 packages come with 1 #3030 humidity bucket, & 1 #1627 25 hatching liners. The 1502ST comes with 3 #3067 trays, 1 #3030 & 1 #1627 liners. The 1502HET comes with 3 #0249 trays, 1 #3030 & 1 #1627 liners. Plastic setting trays such as the T48, T124, 0245, 0246, or 0248 etc. are not included in the incubator package price because many customers already have them. Trays can be added to your order for an additional charge. Call for shipping charges to Alaska and Hawaii. 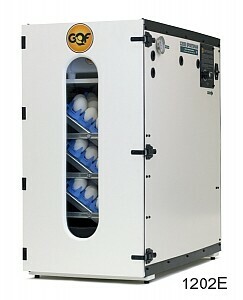 Features 1500 Series Sportsman incubators & hatchers: They are constructed of high strength plastic board which makes the units well-insulated, quieter to operate, & easier to clean. They have a f actory installed 3258 digital command center and the easy-view door. All units come with an instruction booklet and a moisture pan with 2 humidity pads. Features 1502 Incubator: pictured right with T48 trays, features a digital thermostat, electronic egg turning control, audio/visual indicators, dual fans for better air circulation, and an easy-view door. An on-board computer monitors systems and the environment every second to keep itself and you updated. The LCD displays the temperature and humidity. The digital control module, heater, fan, and sensor module are “plug & play” & can be replaced by unplugging the existing unit and replacing it with a new unit. 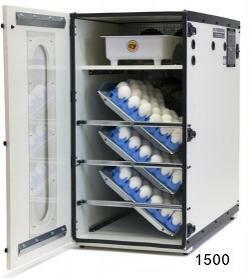 Egg Capacity: The incubator has 3 metal turning racks and 1 plastic hatching tray (no cover). If you want metal pull-out setting trays, order 1502ST which comes with 3 # 3067 metal setting trays. Each turning rack holds 2 plastic egg trays which must be purchased separately. Capacity when the entire incubator is set: 6 KRC-59 trays - 354 bantam, partridge, or small pheasant eggs; 6 KRC-124 trays - 744 quail eggs (double stacking capacity is 1368); 6 T-30 trays - 180 chicken or large pheasant eggs; 6 T-20 trays - 120 duck, goose*, turkey, or peafowl, eggs; 6 T-36 trays - 198 duck, goose* turkey, or peafowl eggs, and 6 T-48 trays - 288 standard chicken, large pheasant, or guinea eggs. *Goose eggs over 3 ¾” in overall height cannot be set in an upright position. Specifications: automatic turning of setting racks, 1 #3258 Command Center pre-set thermostat with an operating range of 60º to 103º F depending on the room temperature, 110-120 VAC. 50/60 Hz, 325 watts. Size: 30.86” h, 15.75” w, & 30.25” front to back. Shipping on hatchers & incubators - 96 lbs DW. *To set large goose, turkey, or peafowl eggs over 3 ¾” in overall height, you can purchase #0249 setting tray. 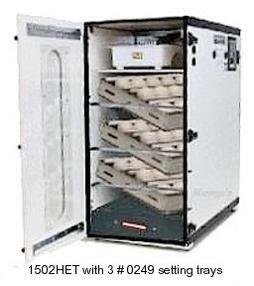 The 1502 incubator comes with three 24 ½” l x 12 ¾” w x 2” pull-out setting trays. Shipping on the 1502ST are listed to the right. 1502 incubator comes with three #0249 metal trays. The 24 ½” l x 12 ¾” w x 2” setting trays come with dividers that screw into the bottom of the tray so large goose, peafowl, or ratite eggs can be incubated on their sides. 45 to 60 geese eggs can be set using 3 trays. Shipping on the 1502ST are listed to the right. Automatic turning, circulated air incubator has the same dimensions & egg capacity as the 1502, The 1202E has an analog multi-turn electronic thermostat control but can be upgraded to the 3258 should you desire to do so in the future. It does not have the digital command center. It comes with the easy-view door and a 3018 thermometer. Shipping charges for the incubator are listed below the picture of the 1202E. priced at $150.00 or more in the GQF catalog. Shipping charges for incubator packages are listed at the bottom or this page. Easy to install. Comes with 4 locking casters, base strips, & mounting tape. 24 ½” l x 12 ¾” w x 2” metal setting tray, pictured above left, has dividers that screw into the bottom of the tray so large eggs such as goose, peafowl, or ratite eggs can be incubated on their sides. 45 to 60 geese eggs can be set using 3 # 0249 trays. 7 lbs shipping each tray. 1 set of 3 dividers is needed for each metal tray in which you want to incubate eggs horizontally. 3066* Metal Hatching Tray is 24 ⅝” l x 14” w x 2” h. Must purchase lid or cover.